Harvard Art | 6 kW Photovoltaic System – Up and Running! 6 kW Photovoltaic System – Up and Running! 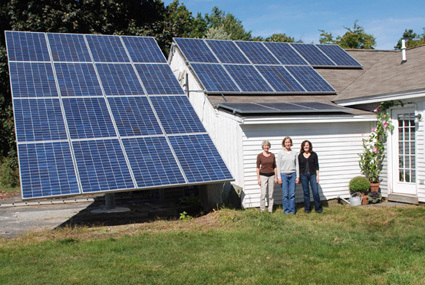 Harvard Art’s new photovoltaic system was activated September 16, 2010 on a bright and sunny day. It was a powerful feeling to turn the switches on the control panels and see the electric meter start to go backwards! Many thanks to Cotuit Solar LLC and for the great job they did from conception to completion and with the grants they obtained which essentially made the project possible. Last sunny day, 34 kWh produced!